Two underpasses in downtown San Jose are getting a facelift. But is it an upgrade or a distraction? It's art, and that’s for you to decide. The two underpasses are both under Highway 87 at Santa Clara Street and San Fernando Street. “So this is all part of a project we've been working on called Illuminating Downtown,” said Jennifer Easton, San Jose's director of Public Art. The project was funded by a $600,000 grant from Our Place America. 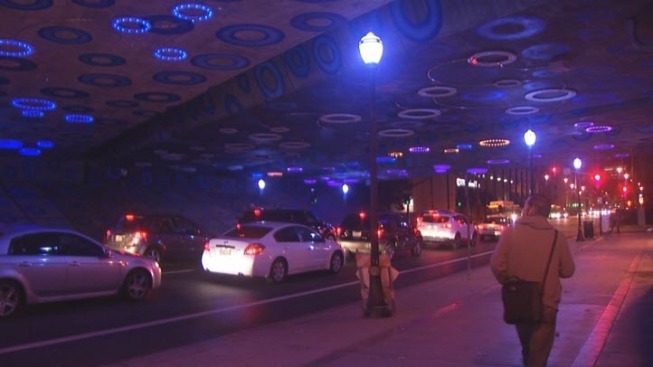 The Santa Clara Street underpass is covered in painted blue circles, and circular lights that change color. The San Fernando Street underpass display is meant to look more like rushing water. The lights can be triggered by motion sensors on the walkway. The more pedestrians crossing the sensors, the more the lights change. "Hopefully it's going to start making people stop and scratch their heads a little bit,” said Dan Corson, an artist on the project . Caltrans required that the display would not distract drivers. So the city and artist spent almost three years making sure there were no rapid flashes or movements. “There's nothing to read, there's nothing to focus on, it's just an experience as you go under it,” Easton said. The project will be finished by Friday.